Last week we had a look at Keaton and Bale’s Batman, so today we’ll be having a deeper look into a comparison between Nicholson’s Joker and Ledger’s Joker. Along the lines of the God vs Man post, when looking at the two Joker’s it’s more of a Man vs a Philosophy. So let’s discuss Nicholson and Ledger’s Jokers. 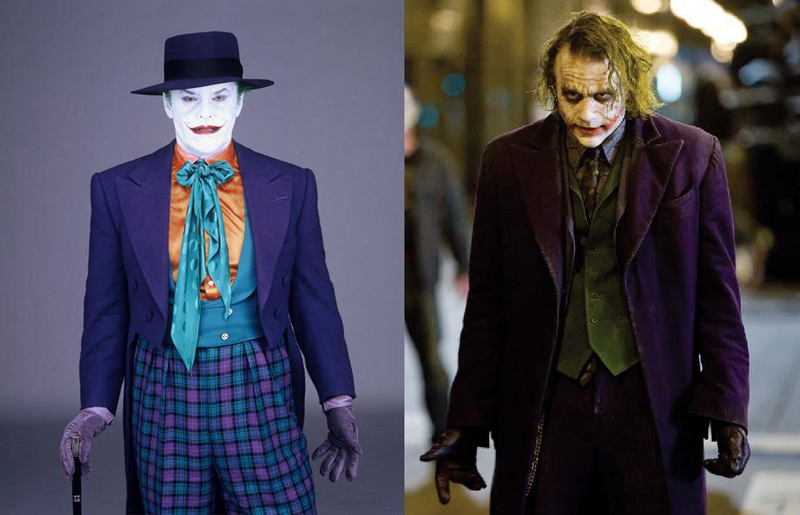 One of the biggest differences between Ledger (In the 2008 Christopher Nolan film ‘The Dark Knight’) and Nicholson’s Joker (In the 1989 Tim Burton film ‘Batman’) is the fact that the audience had a definite origin story for Nicholson’s Joker. We know he was a gangster named Jack Napier that endured a horrific chemical accident (blame the Bats for that) and ended as crazy as ever with a new persona, the Joker, after a surgeon could not properly fix his face. Nicholson’s Joker was very human, and had very human motivations. We knew his name and knew his past. He was a man that was mainly driven by revenge, getting revenge on Batman for letting him fall into the chemical pit. All his actions are targeted towards getting that revenge on Batman. Where Ledger’s Joker painted his Joker face on to look less human, Nicholson’s Joker has a permanent Joker face, and tried to make himself look like a normal man by wearing make-up. Nicholson’s Joker was like the many fictional gangsters out there, trying to make a name for himself whilst getting revenge on those that have done wrong by him. Even though he’s totally crazy and likes to go around completing his criminal activities by dancing to Prince, you can see why he wouldn’t be the biggest fan of Batman. Compared to Ledger’s Joker, Nicholson’s Joker was a lot more human. Because when you take a look at Ledger’s Joker, Nolan is using the Joker’s character as a physical manifestation of a philosophy, the philosophy of an Absurdist (which you can read more about in my Joker the Absurdist: A character analysis post). In Burton’s film we got a clear idea of who the Joker was, however in the Nolan films the Joker is set up as this ambiguous character. The criminals have heard of him but they all have crazy theories about him. Ledger’s Joker is not driven by revenge like Nicholson’s Joker, he’s driven by a need to prove his worldview, that the world is completely chaotic, and the only way to live life is by stop pretending there is order and justice, and just be chaotic with it. And because of that chaotic belief he doesn’t believe in the goodness of other people. That idea is proven as he gets people in his bank heist team to turn on each other to get more money, eventually all killing each other, no such thing as honour among thieves. He also makes a few guys fight each other to the death to be part of his team “we’re going to have try-outs, only one will make the team”. He loves turning people against each other because it further proves his distorted worldview. But his ideas about the lack of inherent goodness in humanity became flawed after his little social experiment on the boat. Thinking the criminals would blow up the boat full of innocents and vice versa, he was quite surprised to find out they both boats chose to be kind to the strangers on the other boat, even if it meant potentially dying themselves. One thing that is similar about both Ledger and Nicholson’s Joker is that they don’t really care about money. They both have bigger plans that aren’t just get rich quick schemes. Ledger’s Joker says “If you’re good at something don’t do it for free”, yet he clearly doesn’t care about money as he ends up burning his pile of cash anyways. For the Joker, what he does is all an attempt at self-validation for his way of thinking, when a guy calls him “crazy” the Joker slows downs his words, and you sense a lack of confidence as he says “I’m not, no I’m not”. Because in the Joker’s eyes he’s the only sane person in the world, the rest of the world is crazy because they can’t see the absurdity of the world. Nicholson’s Joker also doesn’t really care about the money either, as he is seen giving it away to the people of Gotham. Of course that wasn’t some generous act, that was to continue turning Batman’s world upside down. However compared to Ledger’s Joker, you can tell that Nicholson’s Joker was more accepting of the fact that he was the crazy one, not the rest of the world. Everything he did was loud and flamboyant. He danced, and singed and laughed. He genuinely laughed, whereas Ledger’s Joker had a more dry, sarcastic laugh (just think of that scene where Maroni’s men first see the Joker and he walks in with that exaggerated fake laugh). But going back to what’s similar about both Joker’s, they are both insecure. Nicholson’s whole Joker craze happened because Batman fucked up his face. Obviously the chemicals probably messed with his mind a lot as well, but ultimately Batman made the Joker look weird, and he got pissed. Ledger’s Joker is insecure because he doesn’t want his grand philosophy and worldview to be wrong. He doesn’t want to believe that he may be the crazy one, and the rest of the world sane. The Joker wants Batman to “take off his mask” because he believes Batman is like him. I’m going to talk about this aspect of masks and Joker’s need to reassure himself that Batman is like him in my upcoming The Dark Knight analysis/discussion post, but just think about that scene where the Joker is standing in the middle of the street and Batman is charging at him. Joker says “C’mon, I want you to do it, hit me!”. The Joker wants Batman to complete an action that will reflect the fact that they are actually quite similar in that they are both absurd, embracing the chaotic and absurd reality. He wants to prove that Batman is like him to alleviate all of his insecurities about his sanity (or lack thereof). Personally I prefer Ledger’s Joker a lot more than Nicholson’s. I’m more of a fan of keeping the Joker’s origin a mystery, and have him be this absurdist character, however Nicholson’s much more in your face crazy and happy and dancing self can be a lot of fun. But anyways what are your thoughts on Nicholson and Ledger’s Jokers? Let me know! 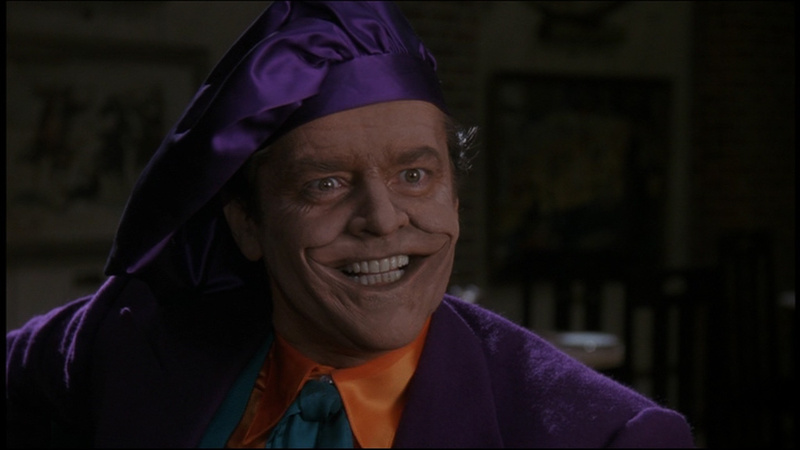 Never was a fan of Nicholson’s Joker….he was too much Nicholson. Of all the “main” Jokers he is my least favourite one. Followed by romero, who I always thought was way less interesting than the Riddler or Catwoman in the 1966 series. Ledger has to fight for the first place with Hamil….but then, I am biased. I was a huge Ledger fan from the moment I saw him the first time in this cheap Australian TV Show (Conner the Celt of however it was called….I honestly only watched for his performance) and had no doubt that he would be able to transform himself into a convincing Joker. And he did. To be honest, he is for me the only reason to watch The Dark Knight at all – I really can’t stand the melodrama and stiff dialogue in the movie, but he makes it worthwhile. Like I said, too melodramatic, and I don’t think that the dialogues in the movie feel natural…which is kind of the point, but takes me out of the story. I forget who, but someone else put the difference between them in a simpler way. Heath Ledger’s Joker is an agent of chaos; dedicating his life to causing anarchy through a calculated plan and trying to prove that everyone is as twisted as he is. Jack Nicholson’s Joker is chaos; other than getting revenge on Batman, he doesn’t seem to have an overall goal and his mood changes constantly. There are several moments in the movie where Nicholson seems to come up with something on the spot as if it wasn’t scripted. With Heath’s joker, everything was planned. I love The Dark Knight by Nolan and what really makes that movie special to me is the Joker, and Ledger’s performance. I watched it again just yesterday. He doesn’t seem to be acting, he just inhabits the character. I don’t see a frame in that movie where he is out of character, or inconsistent, or had not added some little tic or mannerism. He owns that movie. As much as I love Ledger’s Joker, I gotta give it to Mark Hamill for being the best version overall though, but then he was the Joker for like more than a decade (if you count the OVAs and video games) so we got to see more nuance to his performance. Hamill manages to give us the best of the comic-book Joker’s various incarnations from over the decades. We get the obnoxious more Riddler like prankster version, and we get the wounded psychotic all in one with Hamill’s version. He can make you laugh and stab you in the next moment. 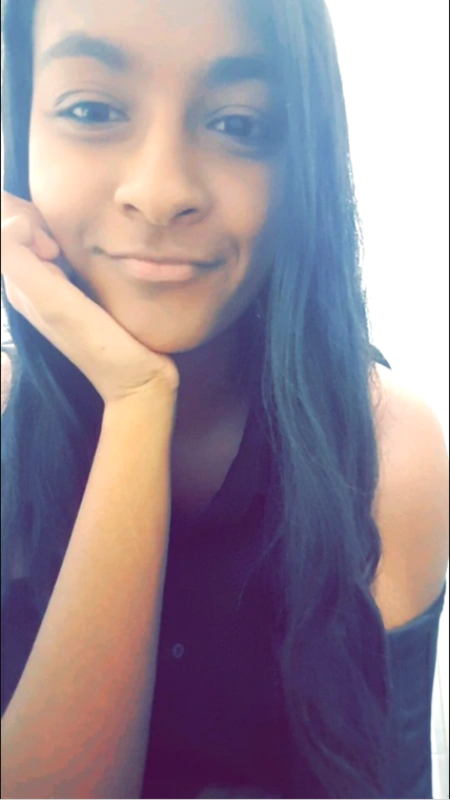 Totally unpredictable, strangely lovable and unforgettable. Mark Hamill is my favourite version of the Joker by far. Oh yeah Ledger for sure owned that movie, it’s scary how good he was, he really inhabited the role! Haha yeah Hamill is pretty great, I would put him as my number 2 though only because Ledger had the physicality of the Joker as well. But Hamill’s Joker was amazing, he sounds so happy yet super maniacal I love it! In the early episodes of Batman the Animated Series Hamill would stand up because he could not sit down while doing the joker voice. He acted out the part physically. I thought Nicolson’s Joker and Ledger’s Joker were both reflective of the times. The Joker character didn’t start getting dark until the 90s. In Nicolson’s time, it’s more reflective of the Adam West show. That´s not true at all. The character was dark from the 40s to mid 50s, was then portrayed more colorful until the 70s when they portrayed him darker again. I think it’s a tie because it’s hard to compare. 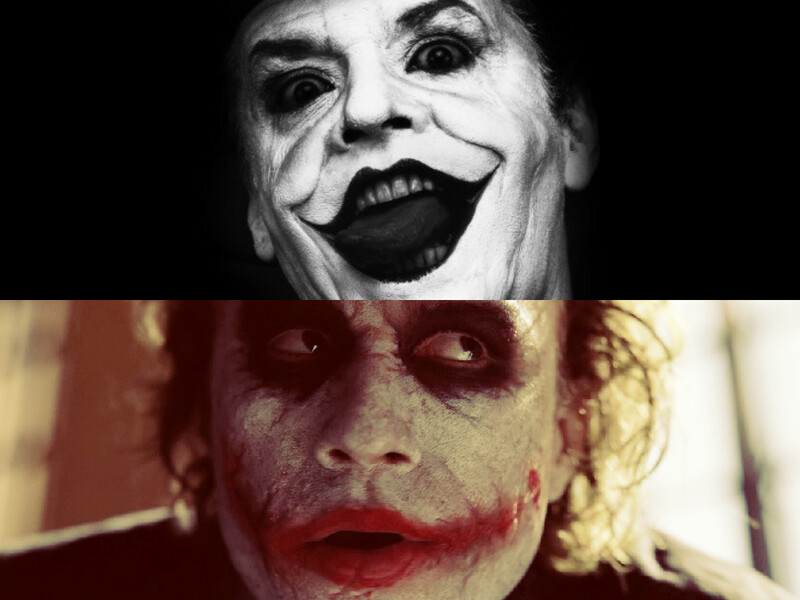 The biggest difference between them is that Nicholson’s Joker was more comic book while Ledger was more realistic. I disagree when people say Jack was campy or not as dark as Heath’s. I think Jack might’ve been more dark, evil and crazier but not realistic. Back then there was no attempt to be super realistic so Jack was more zany, over the top and flamboyant but look underneath and you’re see a truly insane, heartless killer. However Heath did a perfect job in making a comic book villain feel like he could really exist. I like the philosophical views of Heath’s Joker, his bro mance with batman and I love his voice. However I love the human like quality of Jack’s Joker, he was a bad guy who went insane and now anything goes and I love that giant grin. There both iconic performances and I never get tired watching either. I’m looking forward to seeing Jared Leto’s take in 2016. The way I see Nicholson’s Joker is he’s a sociopath: he enjoys doing wrong, he is very expressive about his emotions, and wants revenge. Ledger’s Joker is more of a psychopath: he can’t see that he is doing wrong, he’s very manipulative, and he is trying to break Gotham. The Joker, from my resources, was developed as an antisocial, distorted nut job who wants to break Batman and finds bliss in doing wrong. I personally favor over Nicholson’s Joker, as the character was the classical Joker, and I prefer sociopath villains over psychopath villains. Although, Ledger’s Joker was a well-developed serial killer and anarchist, a combination I absolutely love in an evil force.